Not to be confused with Freemen (disambiguation). The Fremen /ˈfrɛmən/ are a group of people in the fictional Dune universe created by Frank Herbert. First appearing in the 1965 novel Dune, the Fremen inhabit the desert planet Arrakis (also known as Dune), which is the sole known source in the universe of the all-important spice melange. Long overlooked by the rest of the Imperium and considered backward savages, in reality they are an extremely hardy people and exist in large numbers. The Fremen had come to the planet thousands of years before the events of the novel as the Zensunni Wanderers, a religious sect in retreat. As humans in extremis, over time they adapted their culture and way of life to survive and thrive in the incredibly harsh conditions of Arrakis. The Fremen are distinguished by their fierce fighting abilities and adeptness at survival in these conditions. With water being such a rare commodity on the planet, their culture revolves around its preservation and conservation. Herbert based their culture, in part, on the desert-dwelling Bedouin, San People, and the Blackfeet Nation. In Dune, the Bene Gesserit Lady Jessica undergoes the spice agony and gains access to the memories of her ancestors as well as those of the Fremen Reverend Mother Ramallo. This reveals to Jessica that "the Fremen culture was far older than she had suspected. There had been Fremen on Poritrin ... a people grown soft with an easy planet, fair game for Imperial raiders to harvest and plant human colonies on Bela Tegeuse and Salusa Secundus ... Jessica saw the slave cribs on Bela Tegeuse ... saw the weeding out and the selecting that spread men to Rossak and Harmonthep." Herbert elaborates in "Terminology of the Imperium," the glossary of Dune, by noting that the planet Poritrin is "considered by many Zensunni Wanderers as their planet of origin, although clues in their language and mythology show far more ancient planetary roots." The former Imperial capital (and later prison world) Salusa Secundus is "the second stopping point in migrations of the Wandering Zensunni. Fremen tradition says they were slaves on S.S. for nine generations." The "third stopping place" is noted as Bela Tegeuse, and Harmonthep is the "sixth stop." In an early, alternate Dune outline by Frank Herbert called Spice Planet, the Fremen are called the "Free Men" — convicts who had been transported to "Duneworld" to work for the spice operation of the "Hoskanners" in exchange for a reduction in their sentence. The Fremen are organized into communities called sietches. Each sietch has a naib leader, who has ascended to the position by challenging his predecessor and proving himself the strongest in the tribe. The Fremen system of justice relies primarily on trial by combat; individuals may challenge each other hand-to-hand duels to the death over matters of etiquette, law, or honor. The victor of these challenges becomes responsible for the wife, children, and certain possessions of the defeated. Because a duel is fought without water-retaining stillsuits, the victor is entitled to the deathstill-reclaimed water of the deceased to make up for the moisture sacrificed in the fight. Each sietch also has a Sayyadina, a wise woman trained in the spiritual traditions of her people who can serve as a spiritual leader or as an acolyte to a holy woman who is the Fremen version of a Bene Gesserit Reverend Mother. A significant part of the Fremen mythology was created by the Bene Gesserit Missionaria Protectiva, an arm of the matriarchy which practices "religious engineering" by introducing contrived myths, prophecies and superstition among the populations of the Empire with the intent to later exploit them to the advantage of an individual Bene Gesserit or the entire order. In the case of the Fremen, a messiah legend has been put in place that is utilized in Dune by Paul Atreides to secure the safety of himself and his mother Jessica. The Fremen have a language unique to them, but also use Chakobsa for ritual purposes. The Fremen worship the giant sandworms of Arrakis as manifestations of the earth deity they call Shai'Hulud. Though they cross the desert on foot in a specifically nonrhythmic pattern to avoid vibrations that would attract the deadly and destructive creatures, the Fremen are also able to ride the worms by "calling" and mounting them in a ritualized, controlled manner. As part of the sandworm life cycle, the spice drug melange is everywhere on Arrakis, and the Fremen diet is rich with it. Such a level of exposure to the spice tints the sclera, cornea and iris of the user to a dark shade of blue, called "blue-in-blue" or "the Eyes of Ibad." Fremen are some of the best hand-to-hand combatants in the universe, the dangerous conditions of Arrakis ensuring that only the strongest survive. In Dune, Paul trains his Fremen forces in the use of what they call the "weirding way", the specialized martial arts of the Bene Gesserit that he learned from his mother. The Mentat assassin Thufir Hawat is later shocked to learn that Fremen have not only overcome some of Padishah Emperor Shaddam IV's fierce and previously unstoppable Sardaukar soldiers, but have done the impossible and captured some as well. Herbert also writes that "Paul recalled the stories of the Fremen — that their children fought as ferociously as the adults." In the novel Shaddam notes, "I only sent in five troop carriers with a light attack force to pick up prisoners for questioning. We barely got away with three prisoners and one carrier. Mind you, Baron, my Sardaukar were almost overwhelmed by a force composed mostly of women, children, and old men." Most people in the universe rely on personal body shields, which have made all forms of projectile weapons semi-obsolete. Only a slow-moving weapon can penetrate a shield, putting knives and similar weapons in common use. The beam of energy weapons called lasguns react violently with a shield, creating an unpredictable explosion comparable to sub-atomic fusion which can kill the operator, shield wearer, and surrounding individuals. Fremen do not use shields because they also attract the native giant sandworms of Arrakis and drive them into a killing frenzy. As a result, the Fremen have the advantage of being trained to not slow their knives when attacking, as those battling a shielded opponent do. Fremen use different archaic weapons such as maula pistols, lances and crossbows to great effect, but the most deadly and prized possession of a Fremen warrior is the crysknife. A crysknife is a personally-tuned blade ground from the crystal tooth of a sandworm, and is the formal and sacred weapon of the Fremen. It is a milk-white, double-edged curved knife, the blade about 20 centimeters long. The crysknife comes in two forms, fixed and unfixed. Unfixed knives need to be stored in proximity to an electrical field produced by the humanoid body or they will disintegrate after a period of time. Fixed crysknives are put through chemical processes to keep them permanently intact. In Children of Dune, Leto II notes that "The crysknife dissolves at the death of its owner." All young Fremen must go through a ritual confirming their adulthood, which is sealed with the gift of a crysknife to the adolescent warrior. According to the religious beliefs of the Fremen, a drawn crysknife must not be sheathed until it draws blood. The Fremen also forbid outsiders from possessing crysknives, and in Dune the Lady Jessica refers to "the fabled crysknife of Arrakis, the blade that had never been taken off the planet, and was known only by rumor and wild gossip." When the Shadout Mapes gives one to Jessica, the Fremen woman warns, "Who sees that knife must be cleansed or slain!" When two Fremen meet in combat, one will often taunt the other by saying, "May thy knife chip and shatter." The Legends of Dune prequel trilogy (2002–2004) by Brian Herbert and Kevin J. Anderson establishes that Selim Wormrider is the first to use a crysknife during the events of the Butlerian Jihad. The most notable custom of the Fremen is their water conservation. Living in the desert with no natural sources of water has spurred the Fremen to ritualize and build their society around the collection, storage, and conservative use of all moisture. They conserve the water distilled from their dead, consider spitting an oath bond, and value tears as the greatest gift one can give to the dead. Dune suggests that the Fremen have adapted to the environment physiologically, with their blood able to clot almost instantly in order to prevent water loss. Leto II Atreides notes in Children of Dune (1976) that Fremen have a "longer, larger" large intestine "to take back water from everything which came its way." We change it ... slowly but with certainty ... to make it fit for human life. Our generation will not see it, nor our children nor our children's children nor the grandchildren of their children ... but it will come ... Open water and tall green plants and people walking freely without stillsuits. Water is collected from the atmosphere in windtraps that condense the humidity and add it to the underground water store (caches). Water can also be collected from dead animals and people, using a deathstill to remove the water from a corpse for addition to the sietch water store. The Fremen who obtains the body — through discovery or honorable killing — is then given a set of water rings whose markings denote the volume collected. These rings are used as a form of currency, and are backed by fixed volumes of water (analogous to the historical gold standard). For example, the victor of a sanctioned duel would claim his dead opponent's water, and a dead Fremen's water can be inherited by his/her spouse or children. Water rings have a profound significance in matters of birth, death, and courtship ritual. Each sietch has its own water store underground. This store can hold millions of decaliters of water and is accounted for literally to the last drop. This store is used as a bank for all the water owned by members of the sietch through water rings, as well as for the sietch's own store of water for the eventual transformation of their planet into something other than desert. The Fremen spend all time out of their sietch in a stillsuit, a special body-enclosing suit designed to collect and recycle all the moisture the body releases, from urine, feces and sweat, to the exhalation of water vapor in the breath. The special fabric is a micro-sandwich designed to dissipate heat and filter wastes while reclaiming moisture. The water is then held in catchpockets and made available to drink through a tube. A Fremen in a well-kept suit can survive weeks in the desert without any other source of water. Because of their culture's focus on water conservation, it is generally considered a great sign of respect among the Fremen to spit before a person. Fremen also put a great cultural reverence on crying and tears. Tears shed for someone who has died are referred to as "Giving Water to the Dead" and regarded with much bemusement. 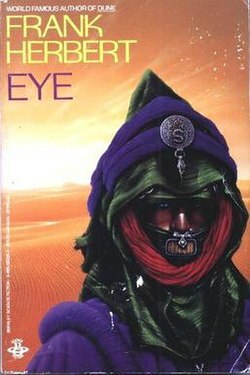 The Fremen have been featured in the Dune series of games, playing a vital role in the plots of nearly all of them. The first Dune game (1992) and Frank Herbert's Dune (2001) are tied closely to the original book by Frank Herbert, retelling Paul Muad'Dib's rise to becoming the Fremen's Messiah, and leading them against the Harkonnens and the Padishah Emperor under the Atreides banner. In Dune II (1992) and Dune 2000 (1998), the Fremen are special Atreides units, native elite guerillas invoked from the Palace. In Emperor: Battle for Dune (2001) they are one of the five sub-factions. ^ a b c d e f g h i j k Herbert, Frank (1965). Dune. ^ McNelly, Willis E. (February 3, 1969). "Interview with Frank Herbert and Beverly Herbert". Retrieved 2008-10-29. Frank Herbert: Well, of course, in studying sand dunes, you immediately get into not just the Arabian mystique but the Navaho mystique and the mystique of the ... black foot (people) of the Kalahari and how they utilize every drop of water. You can’t just stop with the people who are living in this type of environment: you have to go on to how the environment works on the people and how they work on their environment. ^ a b c d Herbert, Frank (1965). "Terminology of the Imperium: PORITRIN, SALUSA SECUNDUS, BELA TEGEUSE and HARMONTHEP". Dune. ^ Herbert, Frank; Brian Herbert, Kevin J. Anderson (September 2005). The Road to Dune. Tor Books. ISBN 978-0-7653-1295-2. ^ Herbert, Frank (1965). "Terminology of the Imperium: IBAD, EYES OF". Dune. IBAD, EYES OF: characteristic effect of a diet high in melange wherein the whites and pupils of the eyes turn a deep blue (indicative of deep melange addiction). ^ Herbert, Frank (1965). "Terminology of the Imperium: CRYSKNIFE". Dune. ^ Herbert, Frank (1965). Dune. [Jessica] tipped up the point, drew a delicate scratch with the blade's edge above Mapes' left breast. There was a thick welling of blood that stopped almost immediately. Ultrafast coagulation, Jessica thought. A moisture-conserving mutation? This page was last edited on 18 March 2019, at 17:08 (UTC).